All parents have lofty goals before the baby actually arrives. These future kids will only listen to cool music, they will never watch Elmo, they will be open to a variety of different foods. Then the baby arrives and Kidz Bop, “Elmo’s World,” and an all-beige diet featuring chicken nuggets all manage to surface eventually. I carefully curated their diet, adding various casseroles eventually from my bible at the time, Annabel Karmel’s Feeding Your Baby And Toddler. It was a huge relief (and lighter kitchen workload for me) when the four of us were finally all eating the same thing for dinner. The twins were growing up at a healthy (and somewhat alarming) rate, so along with naptime, and story time, I felt like their diet was one thing I could add to my short (but significant!) list of parental accomplishments. I really missed the boat by having twins and not immediately using them as a case study or something for an eventual Ph.D. dissertation. Having two babies gave me a interesting perspective on what worked for one, that might not work for the other. 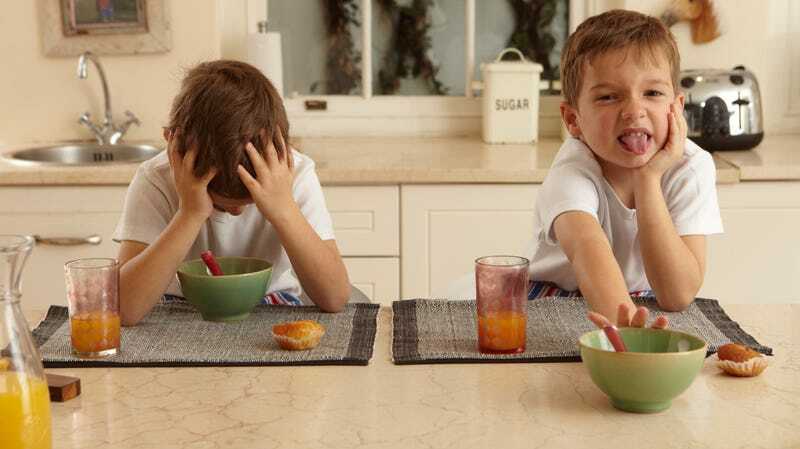 As it turns out—get this—babies are different, so even though these two ate the exact same thing for several years, now that they’re in middle school, their eating styles couldn’t be more different. My son, bless him, will eat just about everything you throw at him. Give him some okra, he’ll shrug and try it out. My daughter—let’s just say she’s the opposite. And I can’t believe how much it pains me every day. Her diet is extremely limited: Kix or waffles in the morning, chicken nuggets for lunch, often canned soup for dinner because she doesn’t like what we’re having. She’s in middle-school, and I’m still trying to bargain with her to eat just a few strawberries with her breakfast, or some apples with peanut butter for snack. Sometimes we cave and buy Nutella for her to dunk pears in, and a jar only lasts in our house a few days. Anything chocolate, of course, she’s absolutely fine with. A constant refrain in our house is one familiar to the home of the picky eater: “You like everything in there!” in a casserole or a stir-fry. When we find a new meal that she’s willing to try—recently it was a homemade broccoli-cheese soup—the rest of us breathe a collective sigh of relief and add it to heavy rotation on the meal calendar. When we go out to eat, she’ll often only eat just the blandest thing on the menu: cheese naan at the Indian restaurant, for example. Spaghetti and marinara (not meat) sauce at an Italian place. So it was with great interest that I read pediatrician Perri Klass’ article in The New York Times last week: “When New Means No: Picky Eating As A Normal Toddler Phase.” Turns out, that “picky eater” phase may not necessarily be one that your child grows out of. There could be other factors in play, like sensory issues or food allergies. Or, like me, you may have given birth to someone who is just not that adventurous about food. Aha! So my daughter’s current eating habits may not be ones that she’s likely to grow out of. Wait… that’s not exactly good news. After all, some people grow up and keep their picky eater status even as adults, and somehow keep all their teeth and don’t develop scurvy. But they also never appreciate the splendor of a food-truck empanada, or a flambéed dragon roll. And then there’s the late Anthony Bourdain (it’s still unbelievably to type those words “the late”). When Bourdain spoke with Takeout editor Kevin Pang a few years ago, he described how he introduced his daughter to food: “I never coaxed her or even suggested that she try something out of her comfort zone. When she was a very little girl if she wanted to eat pasta with butter everyday that was fine with me, but what else was being eaten at the table was often very interesting and to my surprise and delight she would often reach for a sardine or an anchovy… It’s wrong I think, morally and annoying in general, to try to get a kid to be a foodie, so I never even suggested, ‘Hey baby it’s good, maybe you should try it.’ That never worked for me.” Me neither. As a typical dogged, determined parent, I refuse to give up. My daughter loves baking with me, obviously, but what if we translate that activity into cooking dinner? So we’ve started checking more palatable kids’ cookbooks out of the library. We’re making our own chicken and meatballs and other things that she’s previously enjoyed when they come out of a package (unsurprisingly, she holds fast to the Kraft blue box as the only acceptable mac ‘n’ cheese option). Last night, she helped her dad make a bordelaise sauce to go with some some steak (thankfully, her second favorite food group behind chocolate appears to be protein). Hopefully, we can still keep expanding her limited palate. I have a horrific flash forward nightmare of meeting her as an adult at a Manhattan Indian restaurant for lunch (on break from her job as a U.N. translator or Natural History Museum curator or similar), only to have her still only order the cheese naan and chocolate milk. Should parents be held accountable for their overweight children?